At least 30 foreigners are being held in the Democratic Republic of Congo in connection with an alleged coup plot. The men - including South African, Nigerian and United States citizens - were working for a security company. 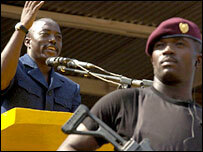 The Congolese government accuses them of being on a military mission to destabilise the country. But a UN official cast doubt on the claim, saying the men were just working for one of the security firms providing services to presidential candidates. The BBC's Arnaud Zajtman in the capital, Kinshasa, says the arrests are an indication of the state of tension in the country ahead of polls scheduled for 30 July. Meanwhile, there has been a big demonstration in Kinshasa by supporters of the long-time Congolese opposition politician, Etienne Tshisekedi. He and his party, the Union for Democracy and Social Progress, has been prevented from standing in the elections after missing a deadline to register and says it will boycott the polls. Some detentions were made before the protests began. The South African embassy in Kinshasa confirmed that 19 of its citizens had been arrested, our correspondent reports. Three Americans and 10 Nigerians are reported to have been arrested, though this has not been confirmed by their embassies. Our correspondent said that the men were all working for a security company and had been involved in training Congolese security trainers who would work at the port of Matadi. One of the men is believed to have been arrested when returning from a visit to South Africa, bringing handcuffs and other equipment to be used in the security training. The South African Department of Foreign Affairs said the 19 South Africans had been arrested on Friday. "Sixteen of these South African passport holders are members of the Omega Security Company, which has contracts with the DRC's National Transport office for the training of security personnel in Matadi, Boma and Mouanda," the department said in a statement. "The other three South African passport holders work for a mining company, Mirabulis, as interpreters," the statement added. But Congolese Interior Minister Theophile Mbemba Fundu said the arrested men were military personnel. "These men, bearing three different passports, were spotted at three strategic sites in the Congolese capital," Interior Minister Theophile Mbemba Fundu was quoted by AFP news agency as saying. "Apparently they are military personnel, most of whom came from Iraq." DR Congo's first democratic elections in 40 years are currently scheduled for the end of July. Last week, the defence minister warned Congolese politicians that they should not have more than 25 bodyguards, amid pre-election tension. Anneke Van Woudenberg of Human Rights Watch told the BBC the growing reliance on private security firms is symptomatic of increasing insecurity in Kinshasa. "There are now more than 10 of them who operate either as personal security guards or who operate as secret service officials who arrest and detain with no regard for specific judicial authorities and this is deeply troubling in the lead up to elections." 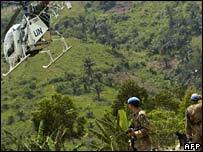 A United Nations peacekeeping force of nearly 17,000 troops - the world's largest - operates in the country and is being augmented by a 1,500-strong European Union rapid reaction force over the election period.